I cook at least once a day – the crew has this terrible habit of liking to eat on a regular basis. 😉 I’m most definitely not a chef, but I can follow a recipe with the best of ‘em. Reverse engineering a recipe, however? THAT is a challenge. These days, who can afford to eat out much? It’s never just the soup. The soup comes with chips and drinks and other people’s meals and it’s just too much money and too many calories. We now live far enough out of town that my cravings can’t just be indulged on a whim, though my sweet husband would certainly try. 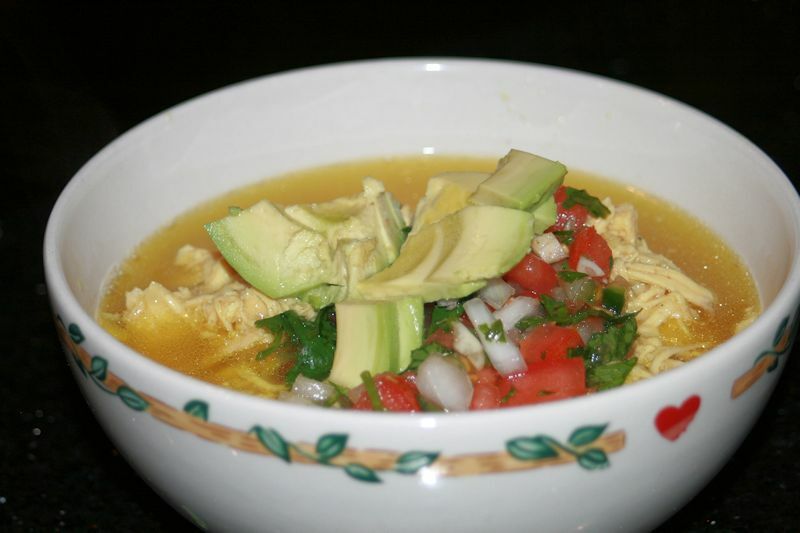 So, I set out to figure out my own version of this amazing chicken tortilla soup. And I think I’ve hit it pretty close! I make this in my crockpot, because if you know me, you know I adore my slow cooker. It just makes cooking so much easier. This recipe evolves occasionally, but this is the recipe we had last night and it kind of rocked. Hope you enjoy! Place chicken breasts in bottom of crockpot and season with onion powder, garlic granules, Adobo, cumin and Sazon. Add chicken broth and water. Cover and cook on low for 6-8 hours. When chicken is cooked through, remove from soup. Remove chicken from bones and shred. Add minced garlic and shredded chicken back to crockpot. Cook on low for another 30 minutes. To serve, add a scoop of cooked rice into bottom of bowl. Ladle soup over rice. Top with Pico de Gallo and chopped avocado. Enjoy with tortilla chips! You’ll note I do not make my own tortilla chips. I have tried, but they just don’t turn out well. Some come out very crispy, some come out burned and some are floppy. All in the same batch! So, if you have a fool-proof method for making your own tortilla chips, please share! Enjoy your very own Chicken Tortilla Soup. that you continue your great job, have a nice afternoon!